What it would take for us and all creatures to live in harmony? Biosphere 2 rises from southern Arizona's high desert like an immense greenhouse spaceship. Originally packed with 3,800 carefully selected plant, animal and insect species, this sealed terrarium holds one of the world’s most biodiverse—and artificial—wildernesses. In 1991, a team of eight scientists and experimental theater performers locked themselves inside this miniature world. They vowed not to come out for two years. Their survival would depend entirely on whether they could learn to cooperate, with each other and with their created Edenic paradise. Things did not go quite as planned. (That's an understatement). 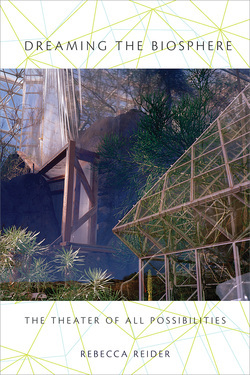 Yet for all its strangeness, the book argues, perhaps strangest of all was how typical Biosphere 2 actually was. Traversing history, the book unfolds this ecotopian adventure as a parable. Dreaming the Biosphere explores the intersections of ecology, community, inspiration and madness, to unravel the story of Biosphere 2—and through it, the story of the human quest for a more harmonious world. “Reider guides the reader to the conclusion that the problems we faced in designing and managing a self-organizing, human-inhabited biosphere are essentially those that confront globalizing humanity. Dreaming the Biosphere offers timely lessons. Available in the U.S. from your bookseller. Available in NZ directly from the author.